BOGOTA, Aug 30 2013 (IPS) - A strike declared nearly two weeks ago in Colombia by farmers and joined later by truck drivers, health workers, miners and students spread to include protests in the cities before mushrooming into a general strike Thursday, demanding changes in the government’s economic policies. The authorities, meanwhile, allege that the nationwide roadblocks and protests have been connected to the country’s left-wing guerrillas. Another target of the farmers’ protests is “Resolution 970”, passage of which was required by the U.S.-Colombia FTA, which protects genetically modified seeds under intellectual property rights, making the replanting of them a crime. It all boils down to the lack of real policies for the countryside, says MIA, which presented a lists of demands before the farmers’ strike began. On Sunday Aug. 25, the protests spread to the cities, after farmers posted photos and videos on social networking sites of the ESMAD riot police’s brutal crackdown on campesino families, including children and the elderly. 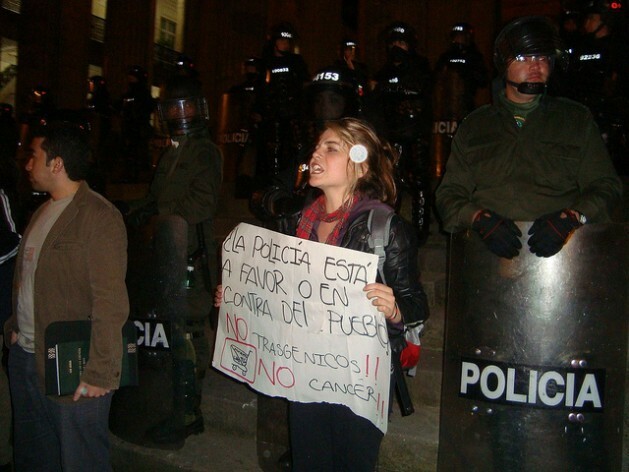 In response to the images and reports of police brutality, people in the cities began to protest, with “cacerolazos” – where demonstrators bang on kitchen pots and pans – which are common in some Latin American countries but are unusual in Colombia. Santos said on Wednesday Aug. 28 that his instructions to the security forces to clear the roadblocks, “as they have been doing,” were still standing. On Thursday, he unexpectedly cancelled his participation in Friday’s Union of South American Nations (UNASUR) summit in Suriname. “A true agrarian reform process has never been carried out in Colombia. Every attempt has failed,” he said. The civil war, which has dragged on for nearly 50 years, “was a pretext for building up military power, and in parallel, paramilitary power,” he argued. “The far-right paramilitaries stepped up the violence against the campesino population, fuelling massive displacement,” he said. According to the figures of the Consultancy for Human Rights and Displacement (CODHES), a leading Colombian human rights group, 5.5 million people were displaced from their homes between 1985 and 2012. From behind the scenes, “the drug lords increased the concentration of land ownership, and today there are very few regions with a small-scale campesino economy. Clear examples are the latifundios (large landed estates) where sugarcane and African oil palm are grown,” Moncayo said. According to January statistics from the National Agrofuels Federation, 150,000 hectares of land are dedicated to sugarcane and oil palm, of the country’s total of five million hectares of farmland. Moncayo said campesinos have lost the ability to make a living by selling their products, thanks also to dumping – the export of products by Colombia’s partners at prices below production costs. “It would be very hard to get the free trade agreements revoked, but it is possible – and urgently necessary – to design sustainable policies for rural development for campesinos,” he said. According to the United Nations Development Programme, 32 percent of Colombia’s population of 47 million lives in rural areas, and between nine and 11 million people depend on farming for a living. “We need to make the transition from traditional agriculture to agroecology, to revive the Colombian countryside,” Adriana Chaparro, a professor at Uniminuto, a private college that offers degrees in agroecology, told IPS. “Agroecology is a big challenge that would make it possible to obtain the best results from farming, without deterioration of the land,” she said. “It would also prevent what many are calling for: subsidies for agriculture, which would require increasingly large investments, which are difficult to finance. “These protests, which include fair demands, are also an opportunity to take a close, critical look at our agricultural practices, without falling into the government’s way of thinking,” Chaparro said.